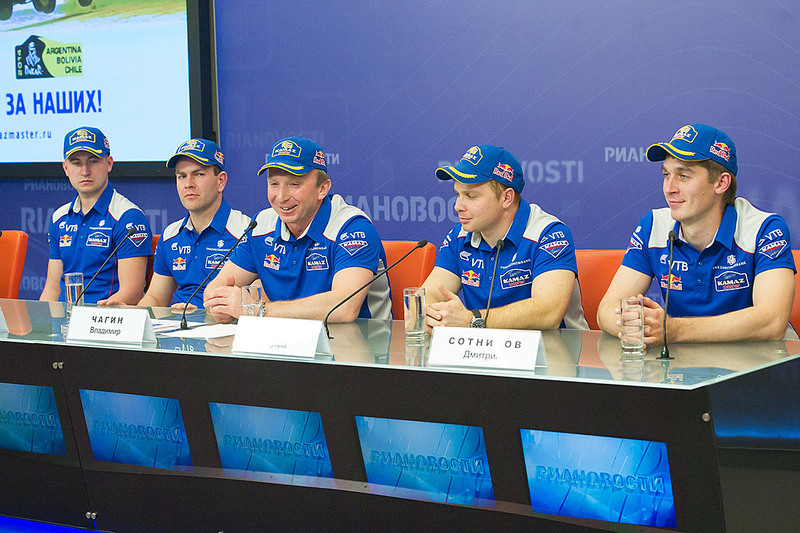 Details of the Dakar rally which is to take place in January 2014 were announced during a press conference of the KAMAZ-master team at the RIA Novosti agency in Moscow. KAMAZ-master is going to send more racers to Dakar this time – in five “combat” racing vehicles. Besides proven crews of E. Nikolaev – E. Yakovlev – V. Rybakov (the crew’s start number is 500), A. Mardeev – A. Belyaev – A. Israfilov (No. 503), A. Karginov – A. Mokeev – I. Devyatkin (No. 506), there will be crews only debuting at Dakar, but already with trophies from Africa Race 2013: A. Shibalov – R. Amatych – A. Khisamiev (No. 545), D. Sotnikov – V. Mizyukaev – A. Aferin (No. 549). Dmitry Sotnikov’s crew will provide other racers with emergency assistance. Altogether, there are 71 racing trucks in the starting list of Dakar-2014. Among them are two HINO and two LIAZ, three RENO and three MAZ, four IVECO, eight TATRA, eight DAF and eight MERCEDES, 11 GINAF and 17 MAN trucks, except five KAMAZ vehicles. Answering the journalists’ questions, Vladimir Chagin, Manager of the KAMAZ-master team, told that all racing vehicles had been updated and tested during the outgoing 2013 year. For example, the trucks received improved electronically controlled Wabco & Knorr-Bremse pneumatic brakes. In 2014, the organizers of Dakar Rally will tighten up emission requirements. Besides, the engine capacity will be limited to 16.5 litres since 2016. Therefore three of five racing tucks which set out to South America to participate in Dakar-2014 Rally are equipped with Liebherr engines. The rest two vehicles are as usual powered with YAMZ engines.